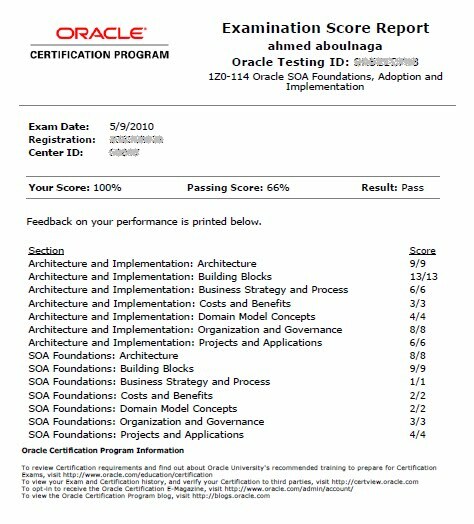 I just took and passed the Oracle SOA Foundations, Adoption and Implementation exam (1Z0-114). The exam is actually acquired from BEA, and is a combination of both the BEA SOA Foundations and BEA SOA Adoption and Implementation exams. Passing the exam grants you an OCE (Oracle Certified Expert) as an Oracle SOA Architect. You will need 20 hours (or more, depending on your current knowledge). 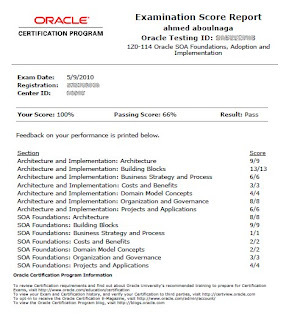 Oracle certification exams are not usually easy, but this provides recognition and credibility to the certification. Based on the scale below, if you have extensive architecture, design, and implementation experience in SOA and related technologies, the exam is slightly above average in difficulty (straight black line). If you are a SOA developer with little architecting experience, the exam may be on the difficult end (dotted black line). Around a third of the exam focuses on explicit technical questions (e.g., a Service Directory provides the ability to discover existing services). The second third involves concepts surrounding the BEA Domain Model (see Study Material). The last third focuses on story-board scenarios, and asks questions in areas such as canonical design, SOA benefits, cost justifications, architectural decisions, process approaches, roadmap prioritization, SOA adoption challenges, and more. 1. Read the study material and know it by heart. BPEL, service composition, orchestration, composite applications, service reuse. XA protocol, compensating transactions, idempotent operations. Calling/exchange paradigms: asynchronous, synchronous, callback, polling, fan-out, callout, uni-directional, bi-directional, fork/join. Terminology: Web services, portlets, WSDL, XML, UDDI, WSRP, JSR, AJAX, HTTP, SSL, SOAP, EDA, JMS, SAML, SLA, canonicals, adapters. WS-* specifications: WS-ReliableMessaging, WS-Policy, WS-Coordination, WS-Security, WS-Trust, WS-Addressing. Products: Service Registry, Service Bus, Policy Directory, BAM, Web Services Manager. 3. Go through the BEA SOA Adoption & Implementation Mock Exam and Oracle SOA Foundations, Adoption and Implementation Sample Questions. 4. Leverage your SOA architecture and implementation experience. The exam assumes architecture level experience within the SOA space. For example, what role does BAM (Business Activity Monitoring) play in your enterprise? What is the best way to push data to BAM? How does this, if at all, impact your main operational process? Unless you have architected the usage of and/or implemented BAM, you may not know. If you can answer these questions, then you should be able to answer one of the BAM related questions in the exam. Being a perfectionist, I noticed a few grammatical errors in the exam, missing periods, double quotes not closed, etc., but nothing that would impact your understanding of the question. Follow what I mentioned in "Preparing for the Exam". This will give you what you need to cover 75% of the exam. Questions are not technical in nature. For example, you will not find questions that ask "What is the request security token structure in WS-Trust?" You will most likely encounter questions such as "Company X currently has services on a legacy system and want to migrate them off. What should they do?" Go through the mock exams. Know the BEA White Paper Domain Model For SOA by heart. If you would like the summary and study notes I made from this white paper, then contact me and I'll be happy to share it. The IBM mock exams I listed above have a few questions that are similar to those that appear in the exam, so going through them will probably firm up your concepts. Great man , I am planning to give this exam. Could you please let me know, if you refered any other material inorder to pass this exam. The 3 things you really need are: the single PDF (BEA Domain Model), sample questions, and your experience. This is not an exam you can solely pass on reading the whitepaper, so I'll be honest and say that experience does make a difference. Also, each and every phrase listed under bullet #2 in 'Preparing for the Exam' appears in the exam at least once, so you must have some familiarity with each of them (you'll find many resources out there, but you won't find a whitepaper that specifically addresses them all for the exam). Thanks Ahmed , I have gone through the domain models white paper, if you have some notes please send it to me , i will appreciate that. I am planning to take the Oracle SOA Architect Certified Expert exam soon and found your blog very useful. I would really appreciate it if you can send me additional notes and study material that you might have. Congrats for passing SOA Architect. Well done, I am planning on taking this exam next week, can you please send to tom_a_a@yahoo.com your additional notes. By the way the link to the BEA mock exam no longer works. Passed the Oracle SOA Architect Certified Expert exam last week and wanted to thank you for the tips provided by you on the blog as the information was quite useful. You were spot on when you mentioned there was no one book or set of material that will make you pass the exam. Most of the times I fell back on my work experience related to web services & SOA implementation, and concepts from IT Service Management to answer the questions. Also, it helped I had previously worked on designing canonical message formats/xml schemas. for Oracle SOA certification on Wednesday. It will be helpful if you can send me your notes and analysis to ann_malla@yahoo.com. Please send me the additional notes on tushar.arsekar@gmail.com. Few days left for the certification to expire. Passed the test today. Thanks for the tips this is probably the best blogpost concerning 1z0-114. There are no vendor specific questions as you said. Hard work and experience will help to pass the test (oracle cource material 800+ pages..). I just pass the certification today, with 98%. Thank you very muh for tips. I have just managed to pass the exam. I got 67%. This exam is tough in the sense you don't have proper materials to rely on.Previously I appeared IBM SOA exam which was more structued and passed it. Also other exams like Sun Certified Java Programmer,Sun Certified Web Component Developer exam and Sun Certified Enterprise Architect were not so tough to pass, as they were more structured. I will be sitting for SOA Foundation Practioner Exam (1Z0-451) within next couple of weeks. Was going through your blog..If you could send some links where I could find some sample questions on the exam, would be really helpful and grateful. Thanks for this great blog,I also will be sitting for SOA Foundation Practioner Exam (1Z0-451)..I would be grateful If you could send some helpful links/info where I could prepare myself, would be really helpful and grateful. Unfortunately, I have not yet taken the SOA Foundation Practioner Exam yet, but I plan on taking it sometime within the next few months. Expect a blog post within the next few months on hints and study notes. If you plan on taking the exam earlier, best of luck to you. I'm planning to appear for the exam next month. Can you please share your summary and study notes. pls share the summary and study notes that you made from domai model white paper.. I am planning to take the Oracle SOA Architect Certified Expert exam this week, i would be very very grateful if you can send me the dditional notes and study material that you might have. The Oracle SOA Architect Certified Expert Exam (1Z0-114), which is now officially retired, is very different from the new Oracle SOA Foundation Practitioner Exam (1Z0-451). Unfortunately, this blog post does not apply to the new Oracle SOA Foundation Practitioner Exam (1Z0-451). Can any one help me to get through it..
And Provide me Dumps for Passing out..
First of all very Informative Blog on SOA. I am new to SOA & planning to do some SOA certifications. Can anyone guide me in this? I am planning to take the Oracle SOA Architect Certified Expert exam, i would be very grateful if you can send me the additional notes and study material that you have. I am more interested on learning more about SOA & implementation. I have some previous experience on Web services and xsds. Could you pls guide me some ways to prepare for this exam Oracle SOA Foundation Practitioner Exam (1Z0-451) as a beginner. Thanks in advance. I am planning take this exam, i would be very grateful if you can send me the additional notes and study material that you have. I am planning to take the Certification. Could you kindly send me the addtitional notes and study material that you've. Thanks for sharing us you experience. I am planning to take this exam.Have completed Oracle SOA Foundation Practitioneer exam last year. once again congrats for you scored maximum marks. Is there any way to change the time of a single synchronous bpel process,rather at domain level. Can someone help to share some oracle soa training material or guide. I'm planning to take Oracle SOA Foundation Practitioner Exam, It would be really great help if you share some study material and notes. my id : rcsasidhar615@gmail.com. Adv. Thanks and congrats for your max score. I M planing to do Soa suite 11g course, and m fresher is will this help me in finding the job. I am planning also to get Oracle SOA Certification. I am also planning to get Oracle SOA Certification "Oracle SOA Suite 11g Certified Implementation Specialist exam" on 30 May. Can you please email me the study material and mock exams at plus_20@hotmail.com. Congrats for the great score !.Can you pls share the study material & mock exams @ roynilanjan1@gmail.com. I am planning to take this exam shortly. I get a lot of great information from this blog. Recently I did oracle certification course at a leading academy. If you are looking for best Oracle Course in Chennai visit FITA IT training and placement academy which offer SQL Training in Chennai. Thanks for sharing this valuable information.and I gathered some information from this blog. I did SAP Course in Chennai, at FITA Academy which offer best SAP Training in Chennai with years of experienced professionals. I have read your blog and i got a very useful and knowledgeable information from your blog.You have done a great job . If anyone want to get Salesforce Training in Chennai, Please visit FITA academy located at Chennai Velachery. Rated as No.1 Salesforce Training Institutes in Chennai. Awesome post i got plenty of tech knowledge in this post... Will follow forever..
Oracle SOA is in part of the DB..IT'S good.. Excellent post. I like your post, Thanks for sharing. Thanku fro sharing this excellent ppsts..
You shared informative post. Thanks for sharing ! hi really you have post an awesome post.it will be really helpful to many peoples.thank you for sharing this blog. Thanks for sharing us your revel in. Your information is really useful and interesting. Thanks for sharing this great article, The oracle Online Training is one of the leading Online Training institute in Hyderabad. we provide low price of fee for on-line coaching. this is a very interesting blog.Thanks for sharing such a wonderful opportunity. Download free Oracle pdf file of Dumps4downlaod, latest Download 1z0-451 dumps that 100% sure. Dumps4Download is the best organization for certified exam study material. You can download your free dumps study guide from our website which provide you with updated and verified questions from the exam dumps with actual answers download it now. 100% money back guarantee if you will not clear your exam. Great blog. Usefull information..Thanks for sharing. Informative post, thanks for sharing. I learned a lot about Oracle.